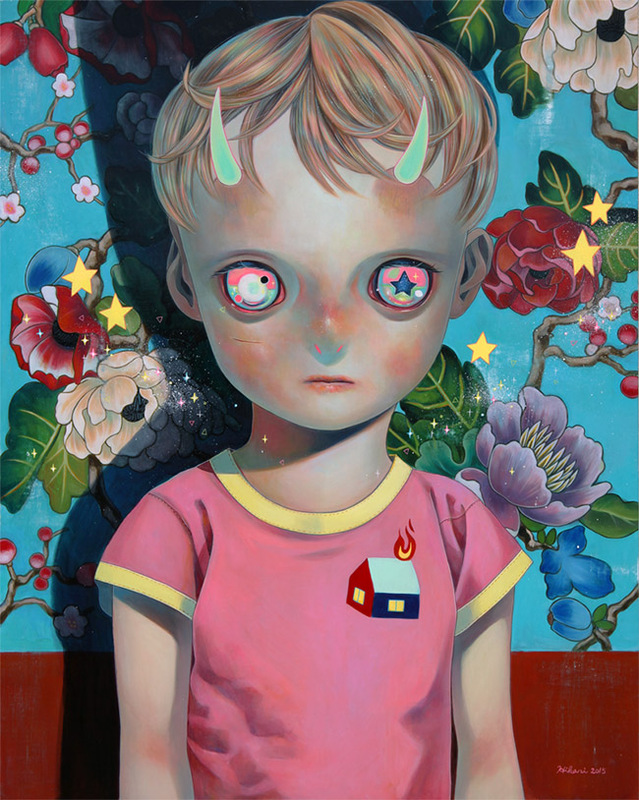 Japanese artist, Hikari Shimoda has been creating portraits of pale, tiny-horned, orb-eyed children with vacant or morose expressions for the past 7 years. 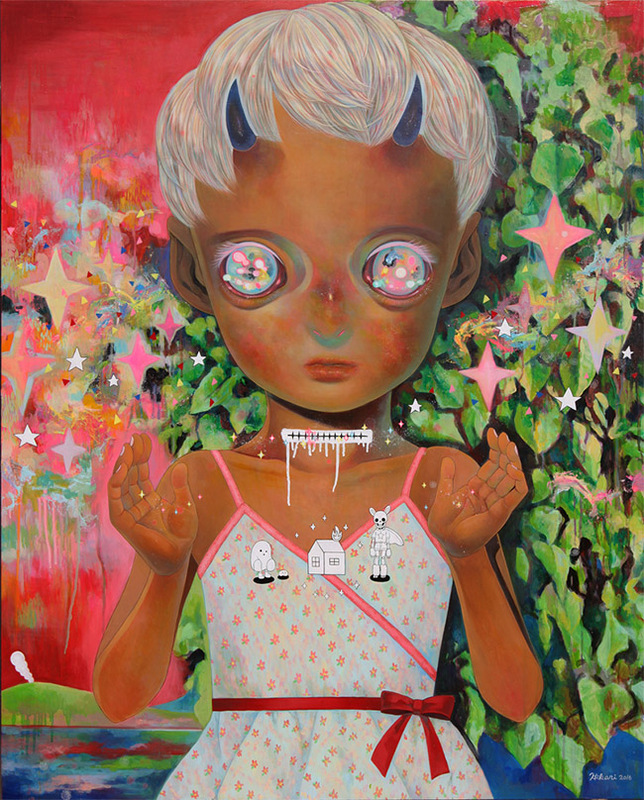 Her unmistakable style, along with her impressive output of over 100 paintings have earned her many international exhibitions, including 4 solo shows at the Corey Helford Gallery in Los Angeles & countless features in prestigious art magazines & blogs. 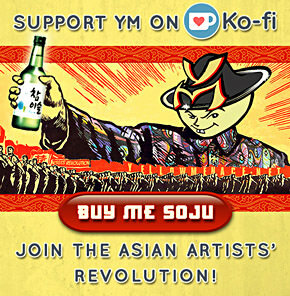 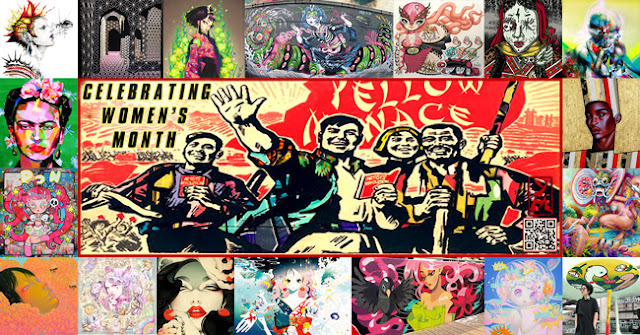 For all of March, I'm celebrating Women's History Month by featuring my favorite Asian female artists here on YellowMenace Blog. 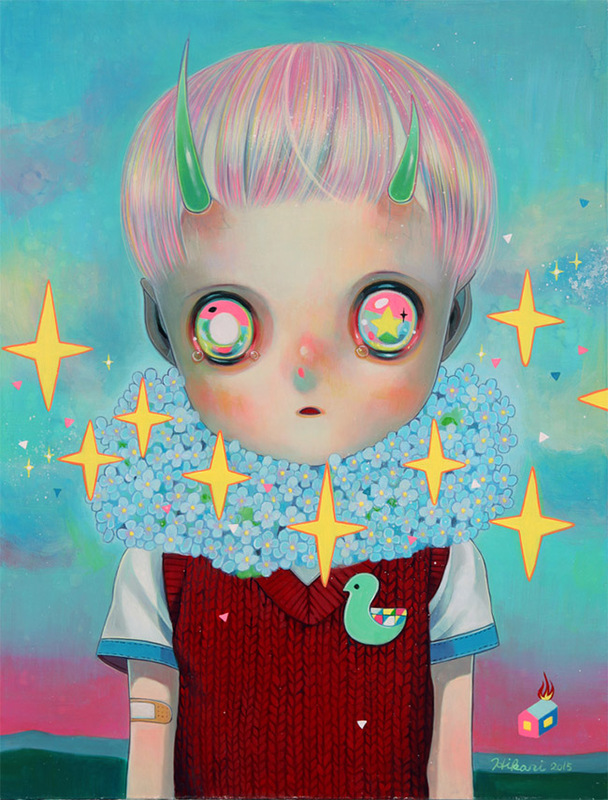 I always find it fascinating to watch artists evolve & play with their style &/or themes. 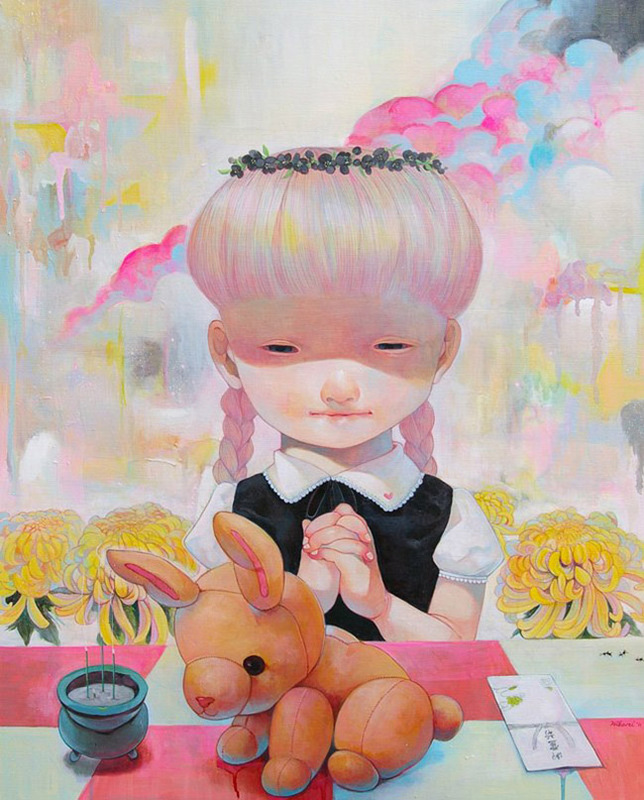 It's a bit like watching time-lapse video of flowers grow. 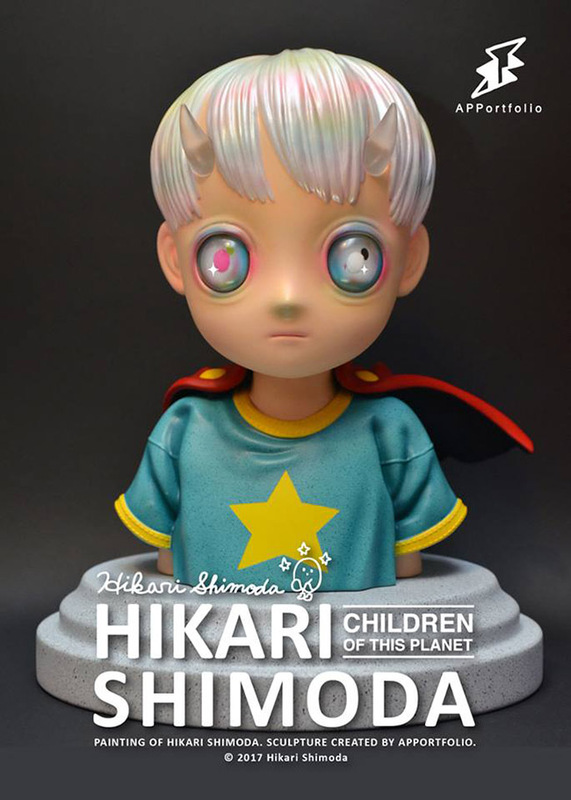 Hikari has always painted semi-realistic children & they've always had these large, colorful, glassy eyes with tiny horns emerging out of their heads, but the clothes, backgrounds & embellishments are always different. 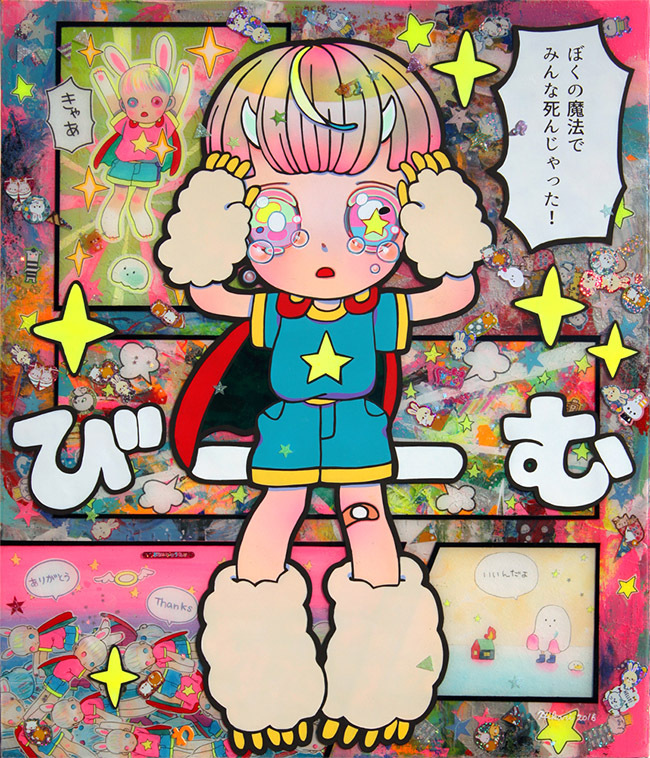 A big step in her evolution was a more pronounced manga / anime influence, sometimes even creating flatter, more cartoonish characters, while the backgrounds have become less realistic & more pop art inspired with brighter colors & mixed media applications of stars, moons & other kids' stickers. 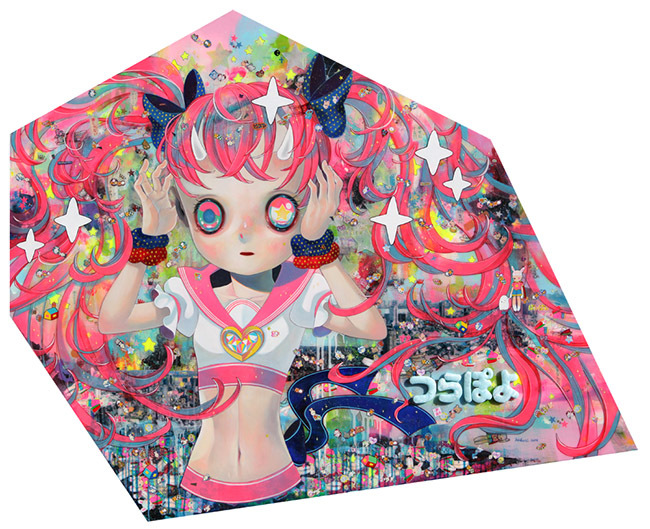 She has even started including manga style speech bubbles, & multiple, full body subjects. 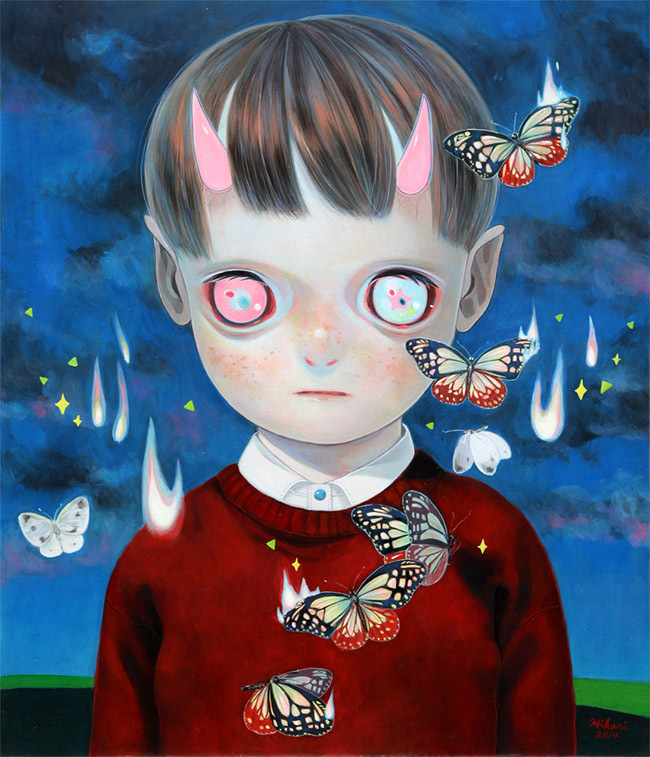 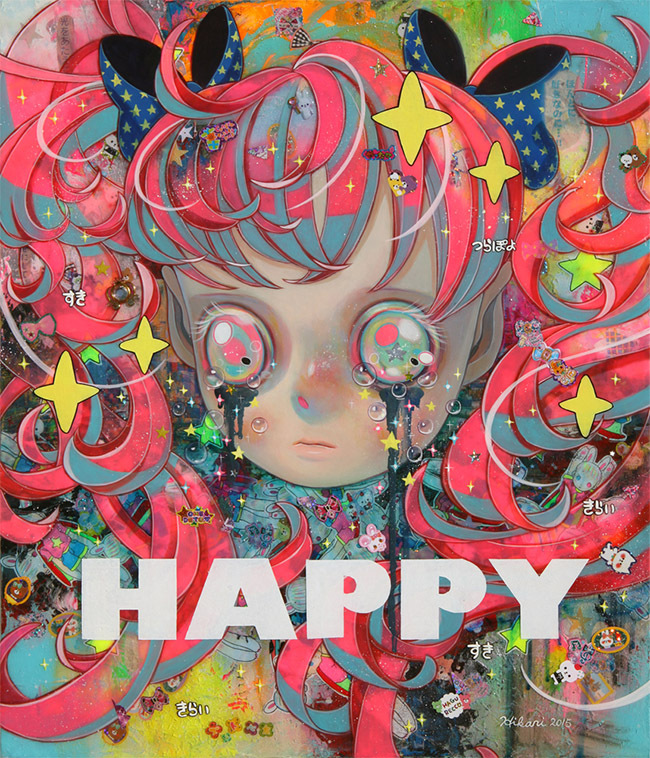 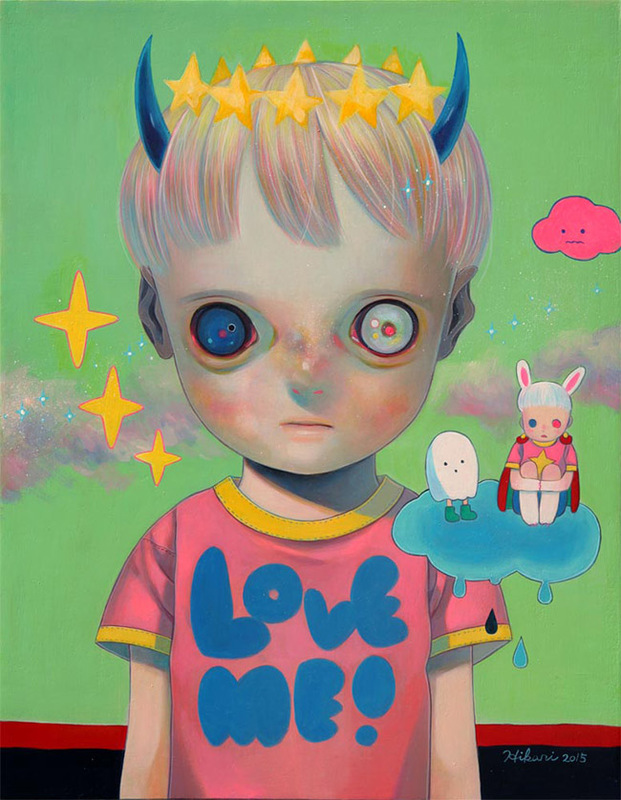 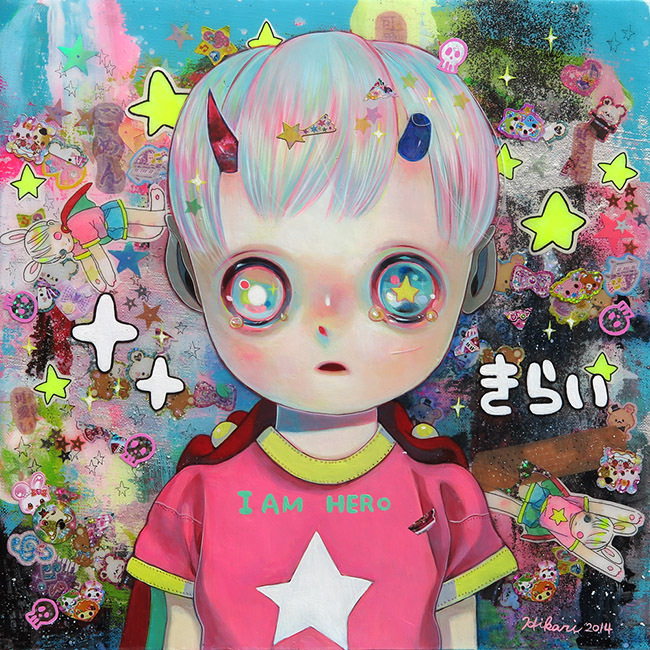 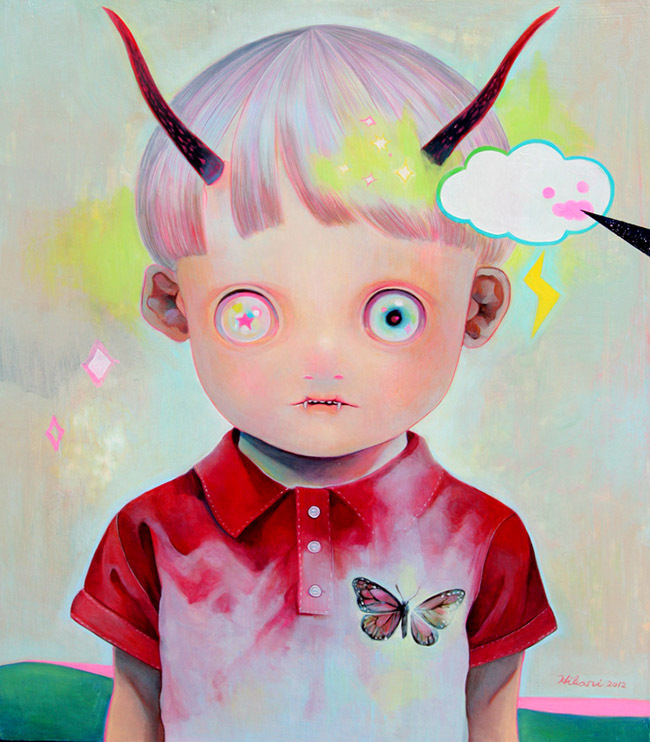 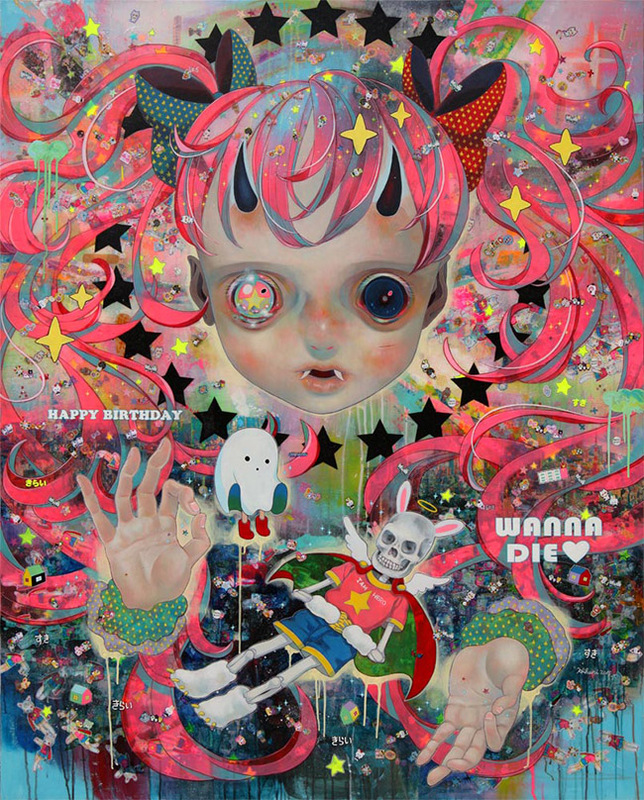 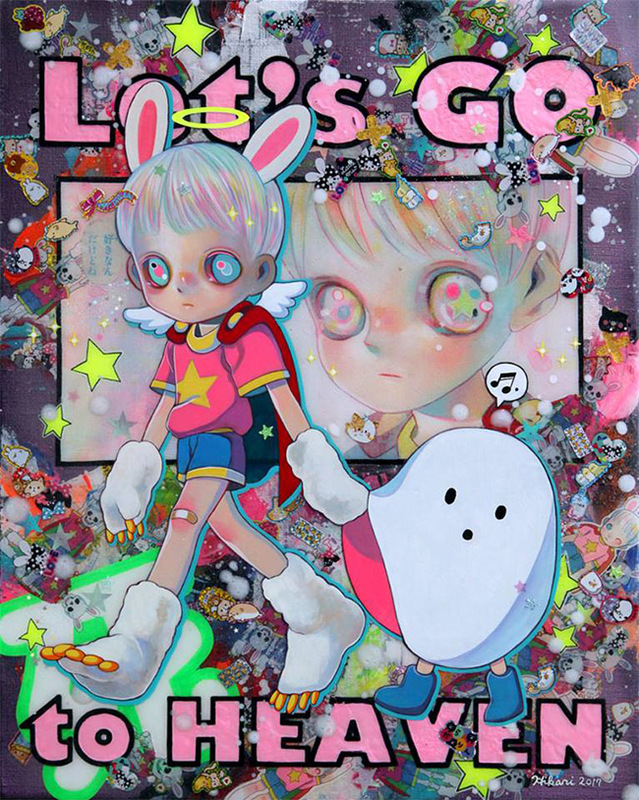 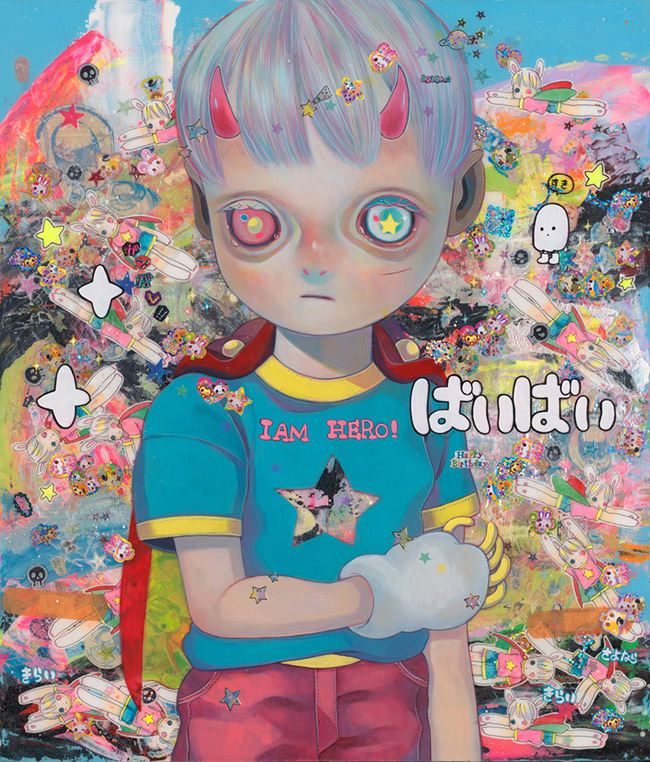 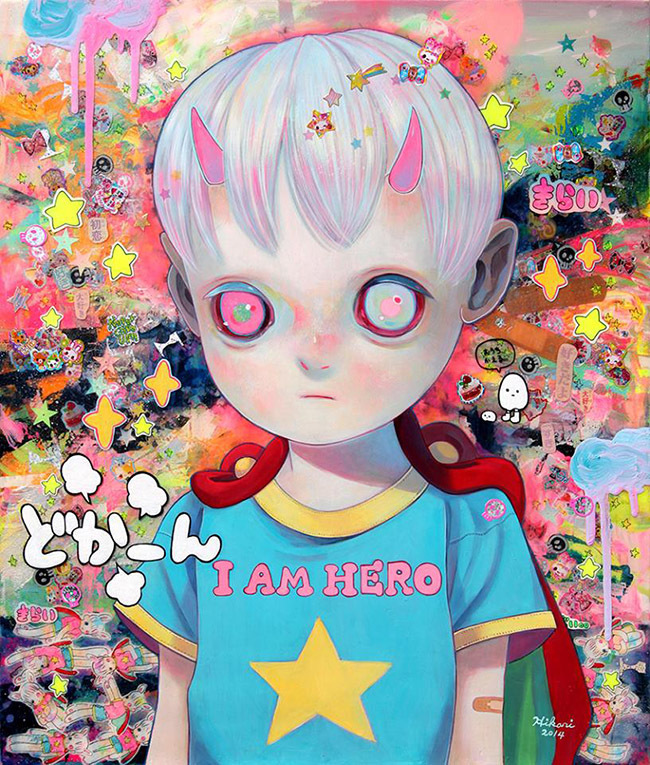 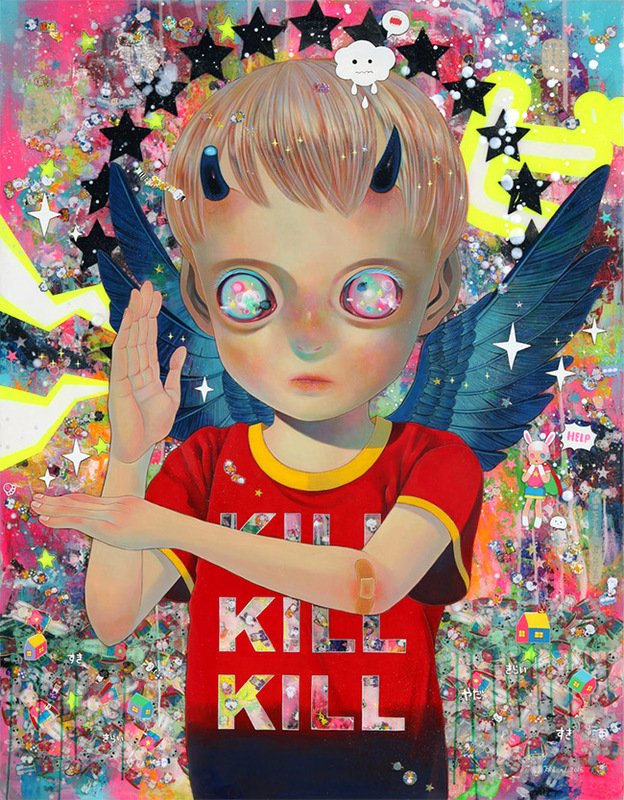 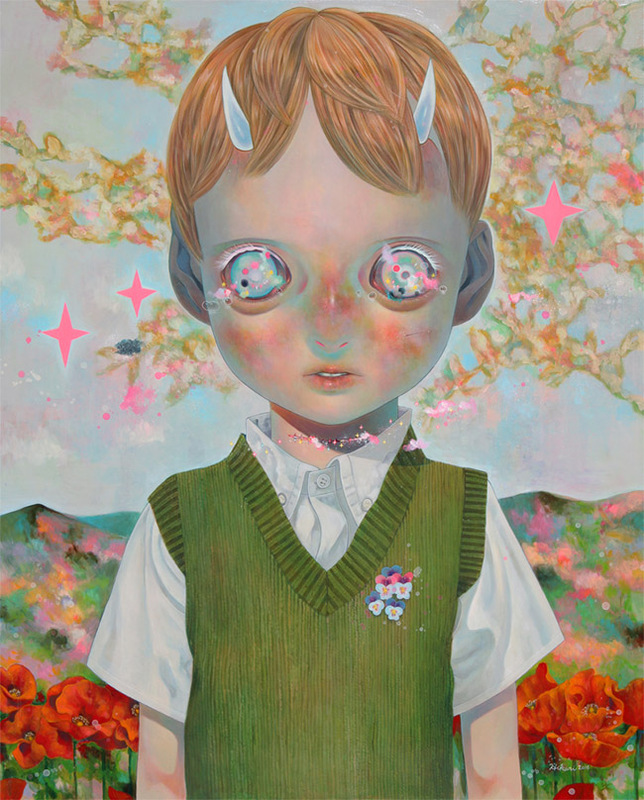 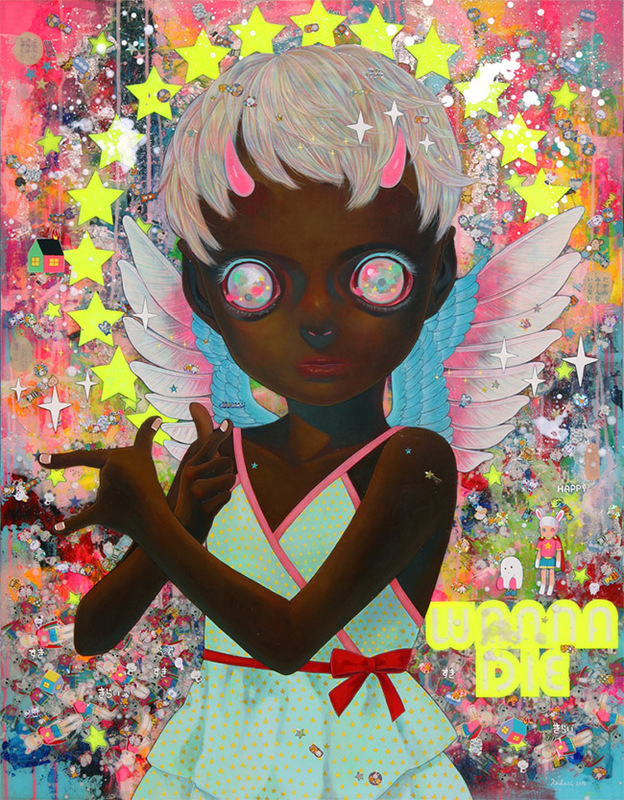 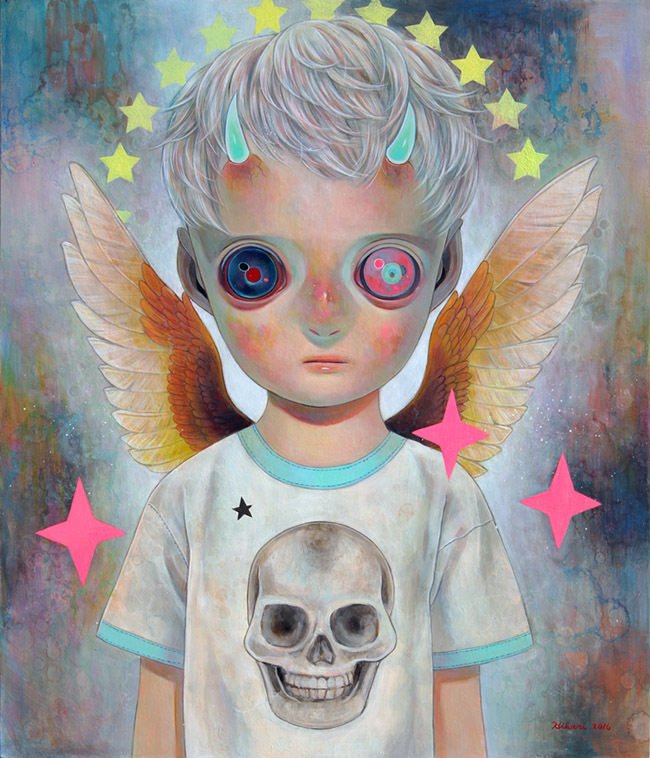 Hikari's work has gained so much attention because these bizarre, pop, anime children ignite the viewers' imagination. 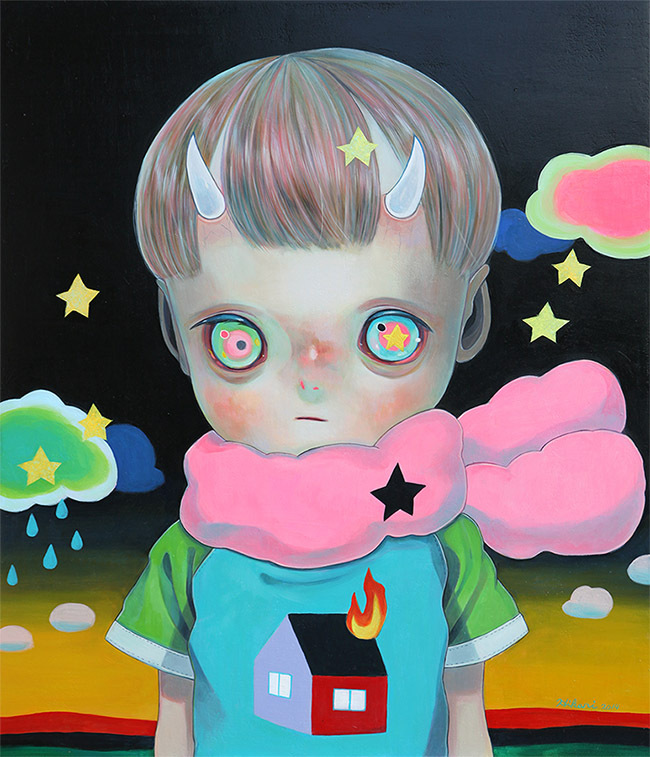 Shimoda's children are usually expressionless, their faces allow viewers to project their feelings about this fragile world & it's uncertain future, as their inner child might perceive it. 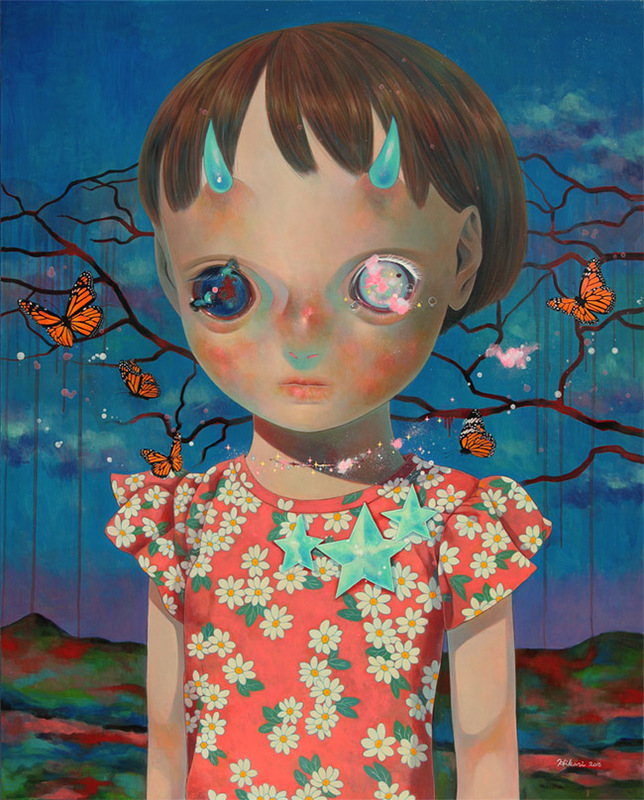 Her portraits seem to call on us to pause & think, "What is all of this doing to the children of this planet!" 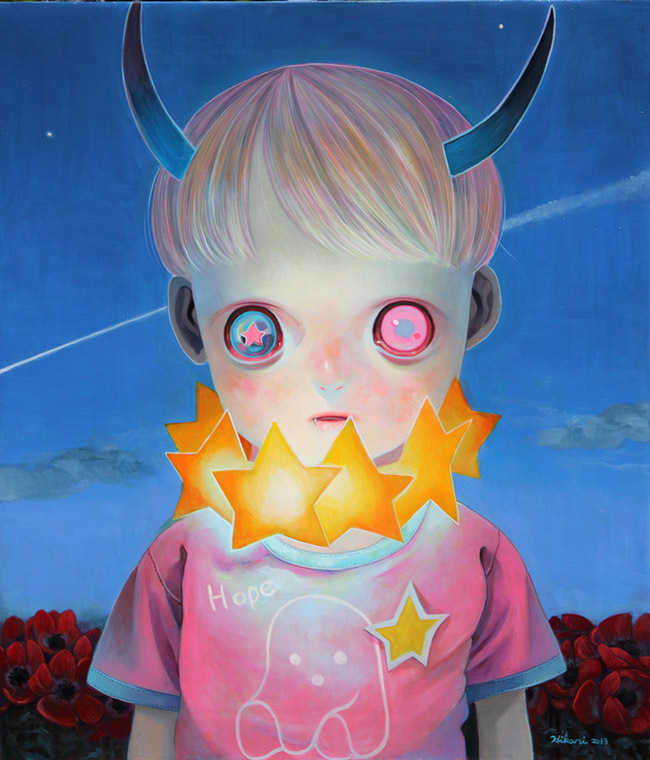 I began seeing Hikari's art very differently, as I was assembling this post because of the recent students' movement for greater firearms control due to the unending mass gun violence in the US. 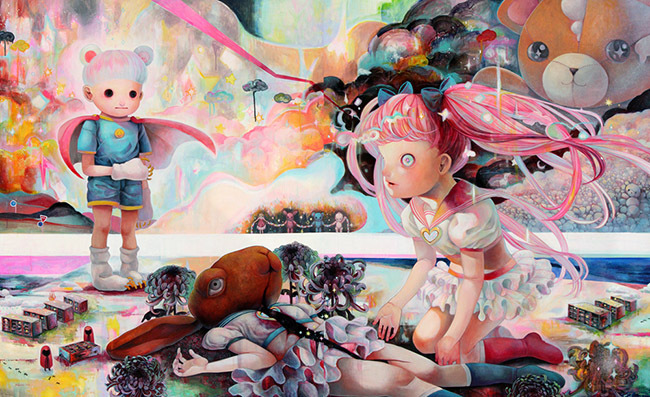 I see in these paintings, the total loss, despair & confusion kids everywhere must feel when they see the news. 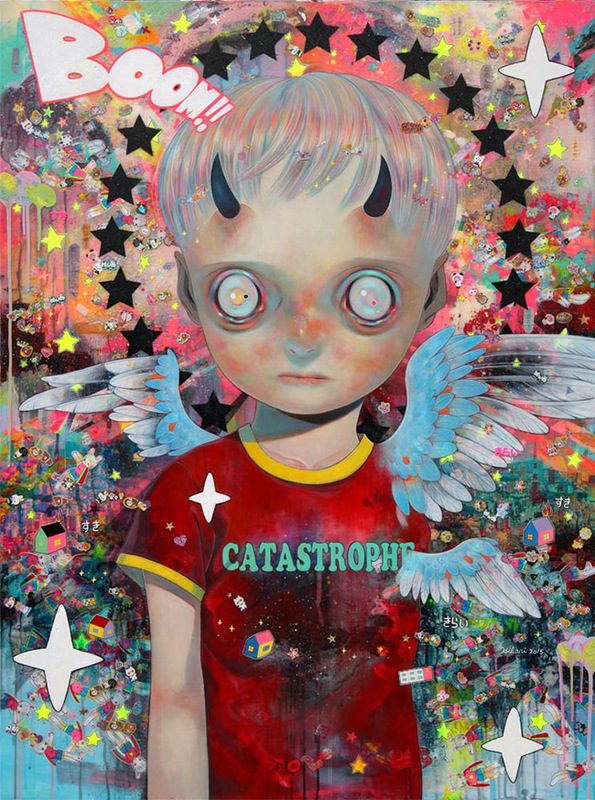 The power of Hikari's work is, in 100 or 1000 years, we will still wonder & worry about the world our children will inherit... if we don't completely annihilate ourselves by then. 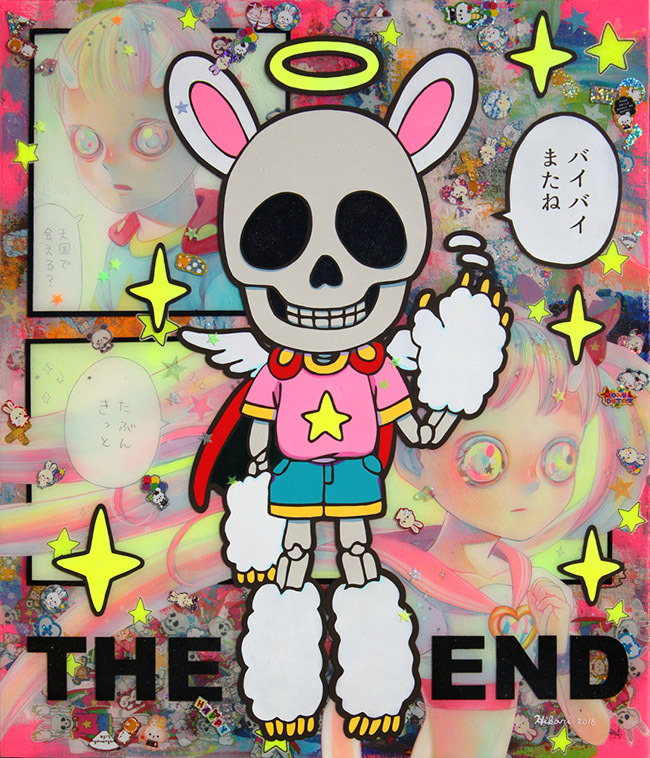 I hope you enjoyed this selection of Hikari's art.